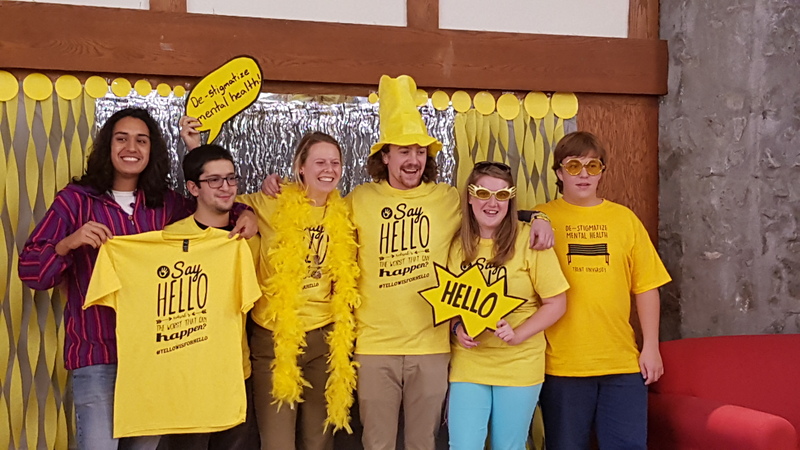 This week we were honoured to be welcomed at Trent University in Peterborough, Ontario. 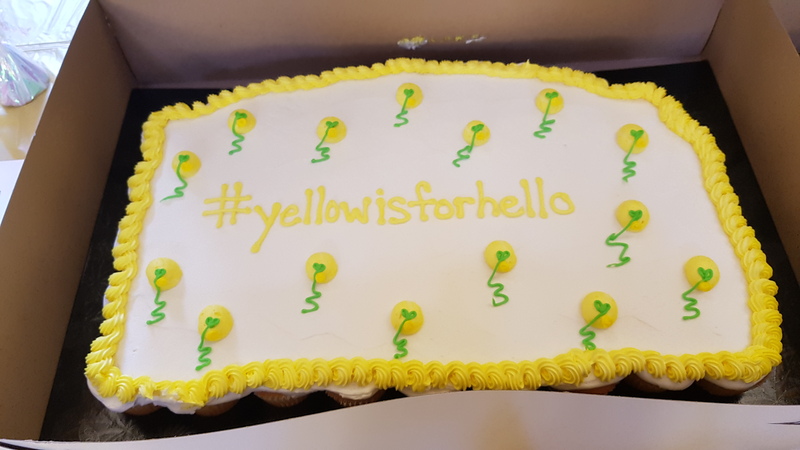 After almost six months of planning, the team at Trent Central Student Association, led by its President Alaine Spiwak, hosted an uplifting celebration for the students to commemorate the launch of the #YellowIsForHello mental health awareness program on campus. 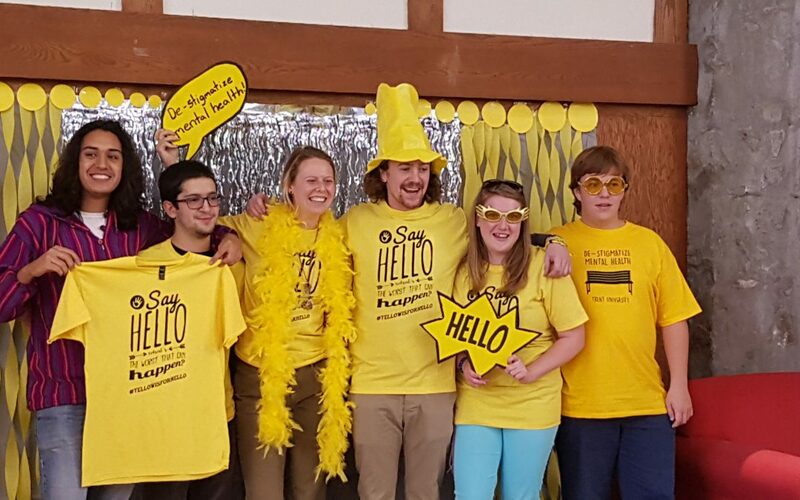 The event, held in Champlain College’s Great Hall, started with 30 minutes of music by a Trent student Duncan Ivany, who is also a member of the band Dickie and The Boys. 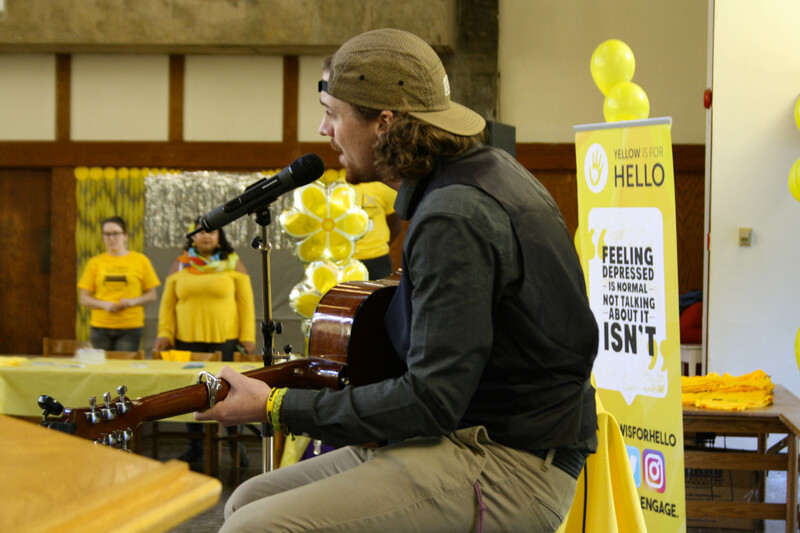 Duncan played an acoustic set including reflective and inspiring songs appropriate for those gathering to learn more about mental health or for those who may be suffering. Alaine Spiwak introduces Duncan Ivany’s musical set to launch the celebration. Duncan Ivany sings How To Save A Life by The Fray and End Of The World by Great Big Sea, among others. 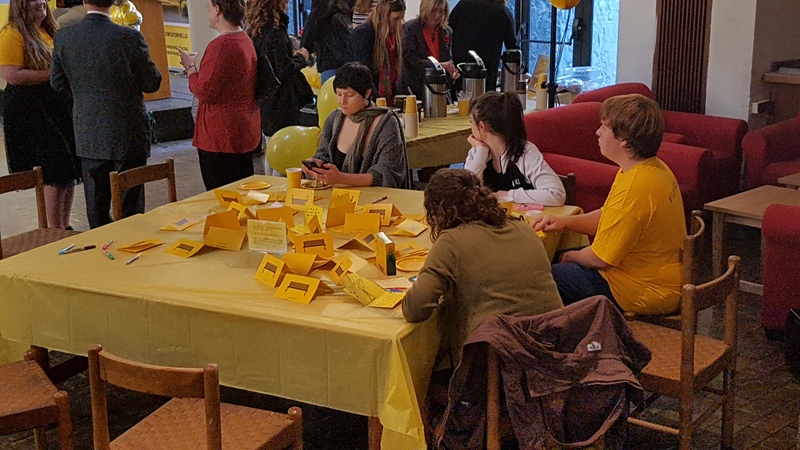 Within the Great Hall, various activity stations were set up to keep students engaged and talking about mental health. 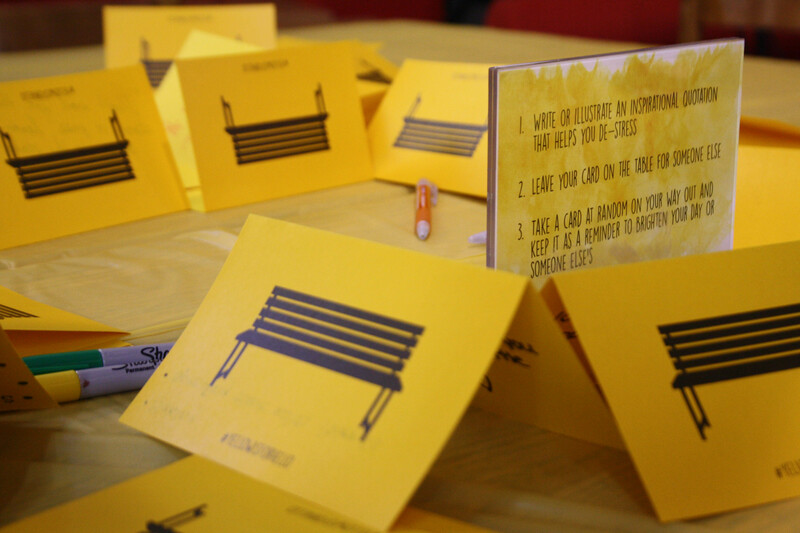 One of these was a community table where students were asked to write or illustrate inspirational messages to other students who may be suffering or just need a positive thought. 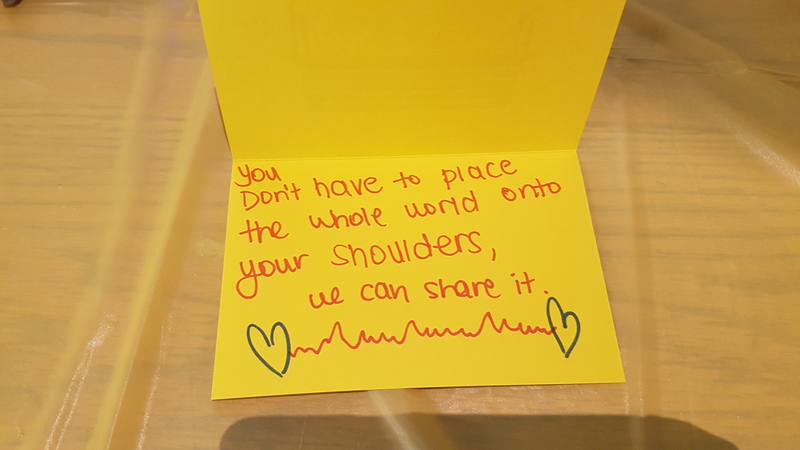 Affirmations authored by students in attendance were left for other students who may need a positive message from fellow students. Students writing positive affirmations for other students to read/take. Sample of the mental health messages authored by students. 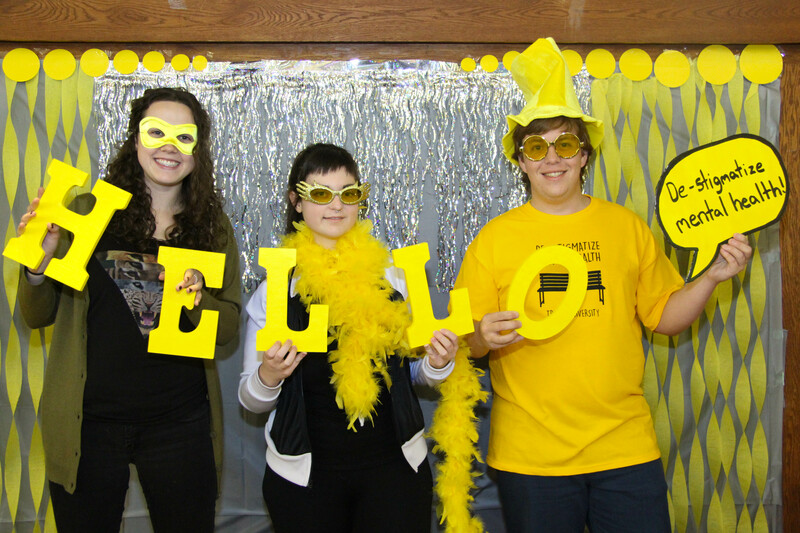 On the other side of the Great Hall, a photo booth was set up where students could dress up and share positive messages via their social networks. 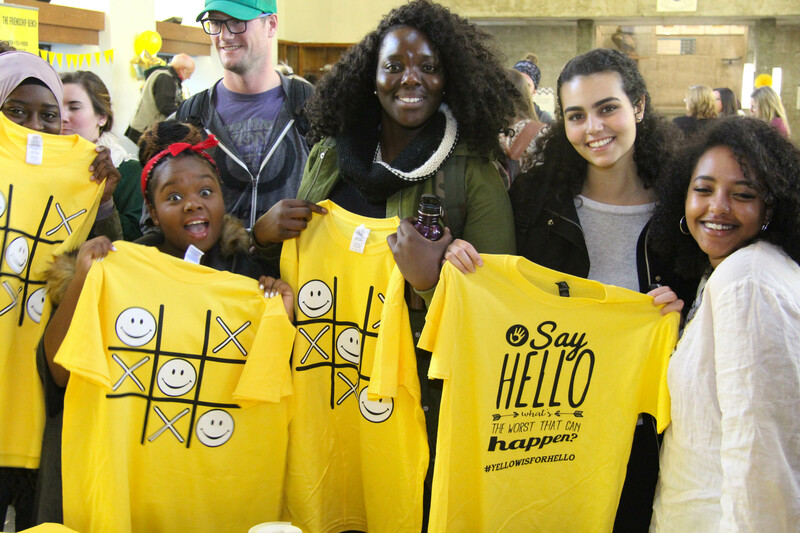 And of course, we were there handing out some swag to help students keep the #YellowIsForHello mental health message alive beyond the event. 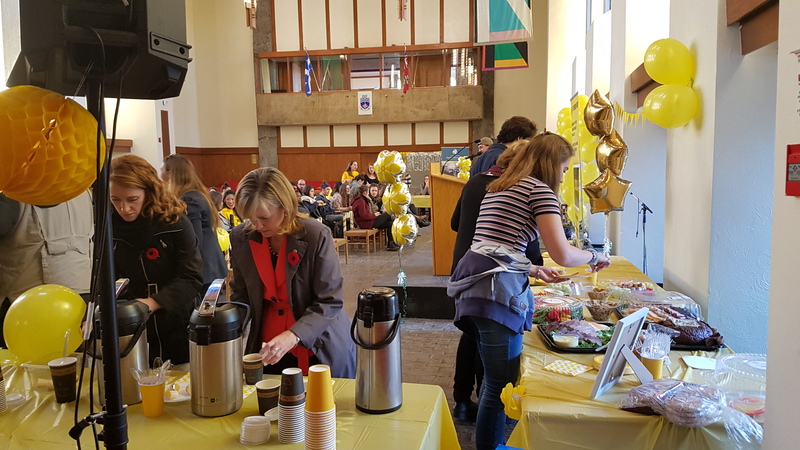 Getting down to business, members of the University’s Student Services spoke about the importance of mental health awareness and how to access available counselling services on campus. 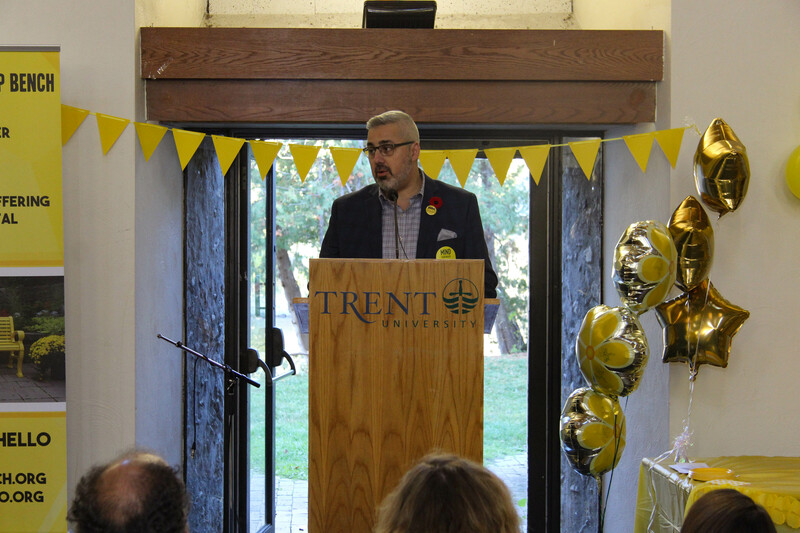 Next, our Co-Founder and Executive Director Sam Fiorella shared some personal stories about depression and how to manage stress while on campus before he dedicated The Lucas Fiorella Friendship Bench to current and future students of Trent University. Alaine, along with University’s representatives, unveiled The Friendship Bench to shouts of “Hello” from the crowd gathered. 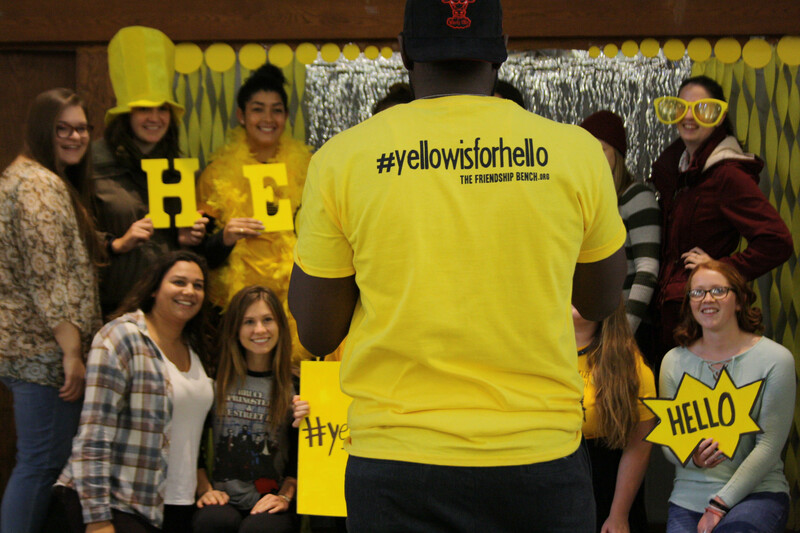 Unveiling The Lucas Fiorella Friendship Bench as part of the #YellowIsForHello campaign on campus. Students and faculty take advantage of the healthy buffet provided to those attending the celebration. Once the unveiling ceremony was completed, the bench was moved to its permanent home at a cross roads on campus where students walk between college campuses every day. 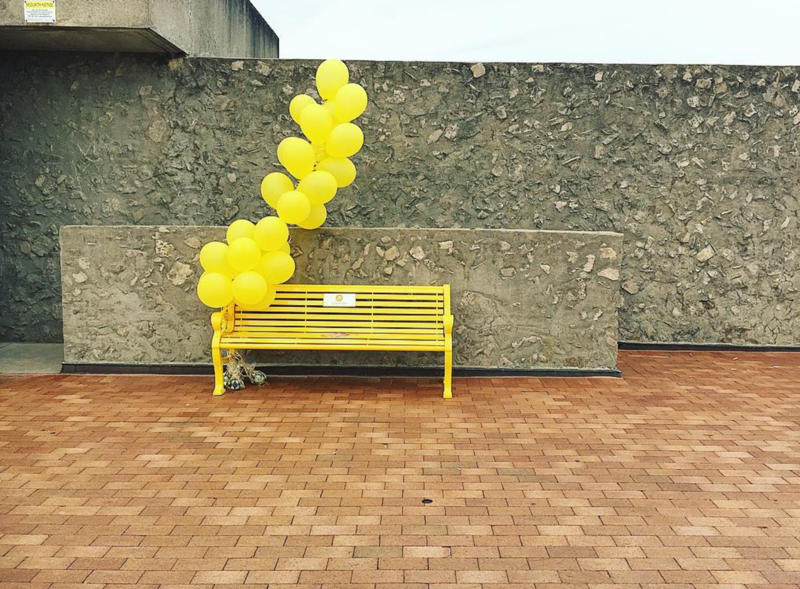 We’re thrilled to lightened up this very grey place with our bench! 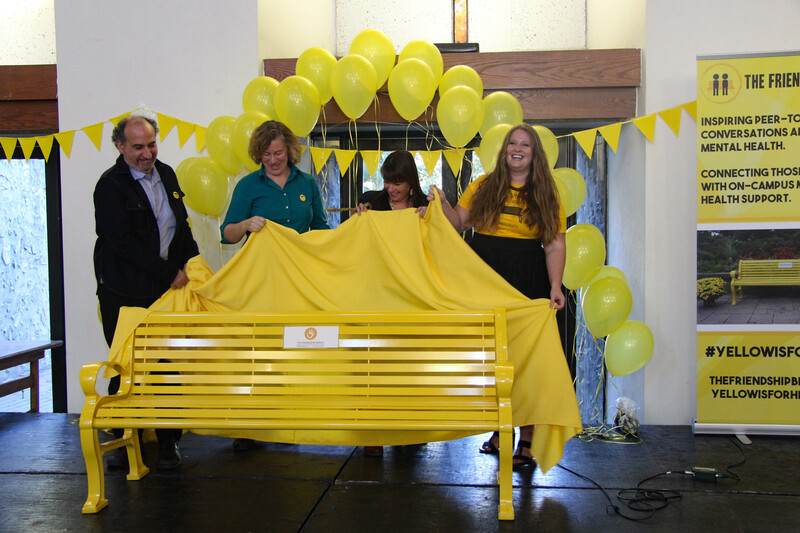 The Lucas Fiorella Friendship Bench — adding a little brightness and hope to students at Trent University. 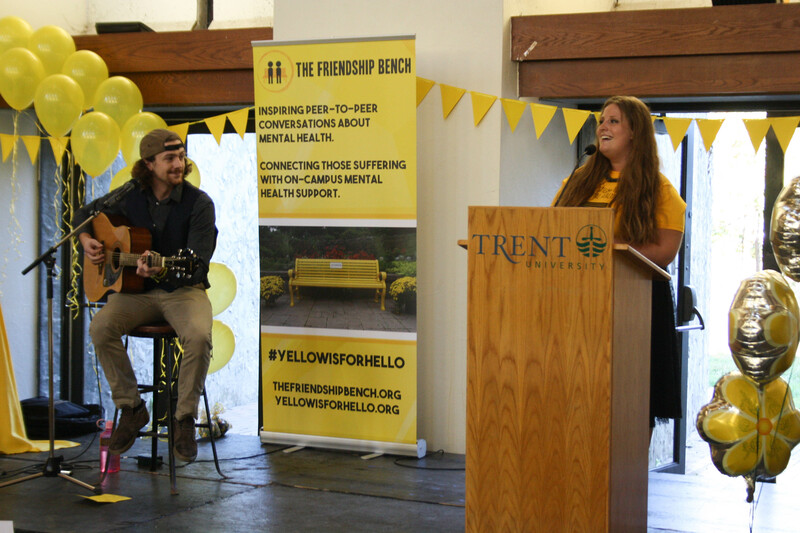 We hope this program and our Friendship Bench will inspire more students at Trent University to talk to each other about mental health, to take care of each other, and to encourage more students to seek available on-campus mental health support services.